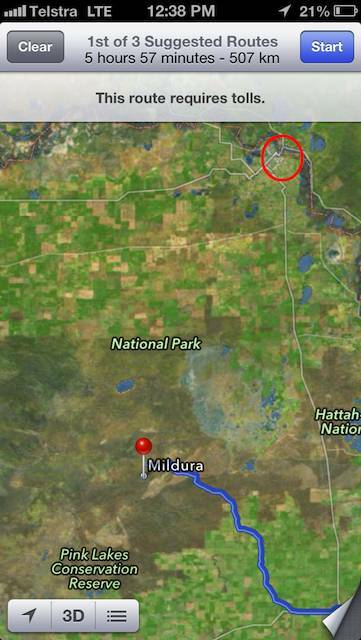 That warning has become rather important because Apple Maps say Mildura is in the middle of the park. Vulture South's own tests confirm that finding, as you can see below. Lest you doubt us, this link will take you to the real location of Mildura. Travellers should also rely on common sense: Mildura is a well-known town as a warm climate and position on the Murray River makes it an agricultural hub. The park, by contrast, is not exactly famous and has precious few roads of any sort. Our investigation of Apple's directions lead us to believe that following them would almost certainly involve leaving a sealed main road likely to offer several signposts for Mildura and instead follow unsealed roads bearing no indication they lead to the town. Cupertino's efforts are far from its best in this instance, but those trusting their phones must share some blame if they end up in the wrong spot.